Champion appeared with Gene Autry as his partner and sidekick throughout their legendary career in film, radio, and television. There were three "official" Champions that performed in Autry films and several specialized Champions, such as Little Champ, Lindy Champion, Touring Champion, and Champion Three. Other horses, for which we have no documentation at this time, served as doubles for movie stunts and personal appearances. The Original Champion was sorrel-colored, had a blaze down his face and white stockings on all his legs except the right front. His first onscreen credit was for 1935's Melody Trail. He died while Gene was in the service. Gene's second screen horse was Champion Jr., a lighter sorrel with four stockings and a narrow blaze, who appeared in films until 1950. While onscreen with Republic, Champion Jr. was billed as "Wonder Horse of the West," and at Columbia, he was known as "World's Wonder Horse." The third screen horse, Television Champion, costarred in Gene's last films and also appeared on television in The Gene Autry Show and The Adventures of Champion during the fifties. Also a light sorrel with four white stockings, he resembled Champion Jr. but had a thick blaze. In the late forties, Little Champ joined Gene's stable. 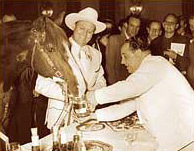 A well-trained trick pony, this blaze-faced sorrel with four stockings appeared in three of Gene's films and made personal appearances. 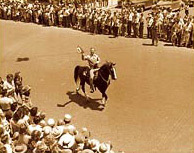 Rushing from a movie set in Hollywood to his annual appearance at Madison Square Garden for the World's Championship Rodeo in 1940, Lindy Champion made aviation history as the first horse to fly from California to New York. Gene used Lindy, a sorrel with four white stockings and an oval-topped blaze, for personal appearances. Touring Champion and Champion Three were also personal appearance horses. A darker sorrel with four white stockings and a medium-wide blaze, Touring Champion appeared at rodeos and stage shows in the late forties and fifties and has his hoof prints next to Gene's handprints at Grauman's Chinese Theater in Hollywood. 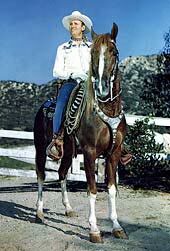 Champion Three appeared with Gene on the road from the late fifties until 1960, when the sorrel with four white stockings and a crooked blaze retired happily to Gene's Melody Ranch in Newhall, California, where he died in 1990. Collectively, the Champions performed the world's largest repertory of horse tricks, including dancing the hula and the Charleston, jumping through a ring of fire, and playing dead. Greeting crowds from Brownwood, Texas, to Dublin, Ireland, Touring Champion even enjoyed a proper high tea at the Savoy in London. Always popular, Champion received thousands of fan letters each month, proving that the World's Wonder Horse was an important element in the Singing Cowboy's success. 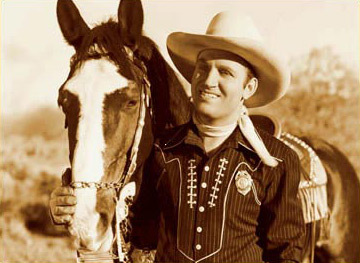 Throughout their careers, Gene Autry and Champion were featured in dime novels, children's stories, and comic books. Champion even received equal billing with Gene above the leading ladies on movie posters and lobby cards promoting Autry films. If you'd like to know more about Champion and horses in the movies, we recommend the book Hollywood Hoofbeats: Trails Blazed Across the Silver Screen by Petrine Day Mitchum with Audrey Pavia. For details, read here. You'll also find information on Champion and Gene's movies and television shows in the book Gene Autry Westerns by Boyd Magers. For details, read here. A variety of horses were known as Champion over the years. To learn more about each horse's role in Gene's career, click on the photos below.